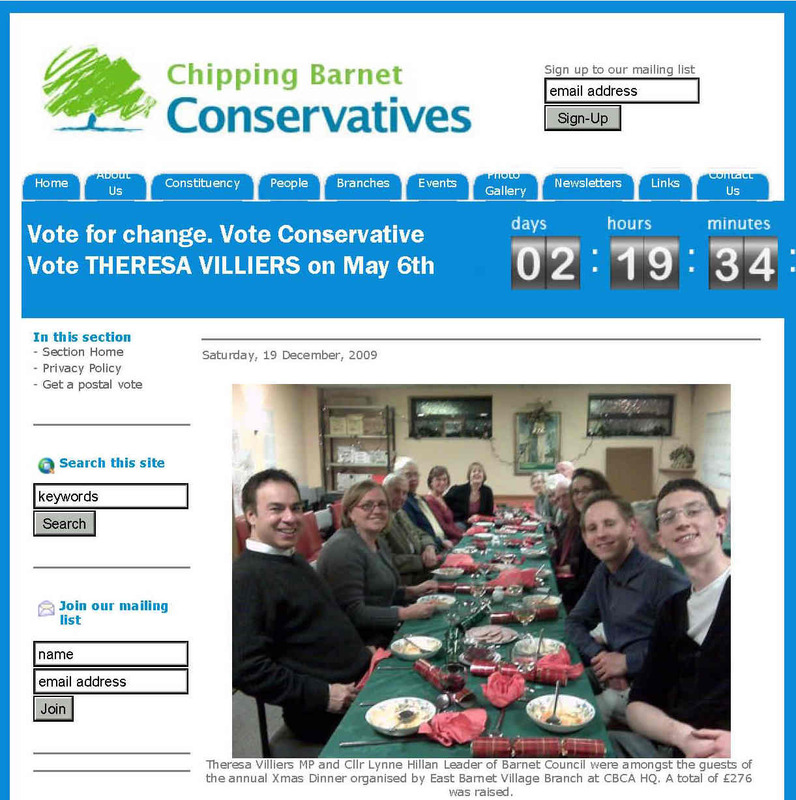 The lovely picture above appears on the Chipping Barnet Conservatives web site. It was taken at their Christmas fund raising dinner for East Barnet branch. The newly elected leader of the council, Lynne Hillan, is sitting second from the left. At the far end of the table is Cllr Joanna Tambourides. Sitting second from the right, just in front of Theresa Villiers, is council officer Richard Robeson who is the Cabinet Advisor to the Tory Administration. He took over from former Conservative councillor Dr Vanessa Gearson when she was promoted to the position of senior spin doctor (all paid for by the taxpayer of course). As you would also expect, Barnet Council and the ruling Conservative Administration take absolutely no notice of the protocols when it suits their own purpose. As Leader of the Council, Lynne Hillan knows (or should know) what the rules about socialising with officers are, and even if Mr Robeson was invited to this function without her knowledge, she should have taken action to rectify this breach of the protocol as soon as it became apparent, rather than posing for a photograph which she would have known was likely to be used for party political purposes. This was not a technical breach of the code as Cllr Hillan and Mr Robeson voluntarily sat close to each other at the dinner table and then posed for a photograph. Don’t Call Me Dave is reliably informed that the council’s Head of Corporate Governance has been aware of this photograph since the beginning of February but has taken no action whatsoever against the individuals involved. Clearly the rules which other political parties are required to obey, do not apply to Barnet’s Conservatives or their lickspittle lackeys. DCMD. Your blog constantly reminds me why I am standing as an independent in the local election. Take a look at the www.newandeastbarnet.org website. The Committee for Standards in Public Life set down seven key principles which everyone in public life should adhere to. I challenge anyone to read them and say that the current regime are following them all, both to the letter and the spirit. That is why people should be voting on Thursday and that is why they should be voting for a change!